We spent the weeks before the holidays in the far southern tip of Belize. The little town of Punta Gorda sits on the water, and every day travelers and migrants arrive by boat from Honduras and Guatemala. PG, as it is called, is the capital of the country’s wettest region, known as Toledo. 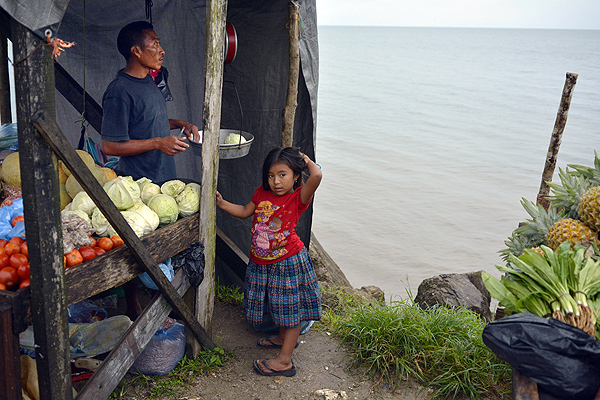 It’s also the poorest and the most rural, sometimes called “the forgotten district.” But it’s full of life. As in most places, the local market is a good spot for flavor. 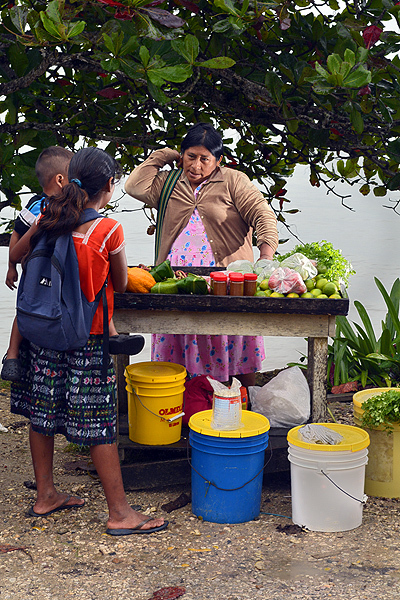 The town’s permanent market is under renovation, so vendors are temporarily settting up shop next door, along a one-lane road right on the Gulf of Honduras. 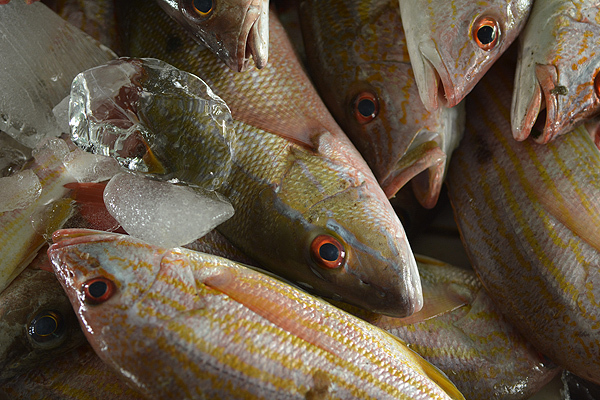 This market has few rivals in backdrop – lapping waters and sea birds swooping behind makeshift wooden stalls. The clientele reflects the ethnic mix that is Belize: Mopan and Kekchi Maya, Garifuna, Creole, East Indian, Mestizo, Rastafarian and more. Mennonites with suspender-clad pants and long red beards are the area’s primary suppliers of dairy, chicken and produce. They often roam village to village, selling melons from horse-drawn carriages. But they’re here at the market, too. Chinese shoppers carry bags with Chinese characters. 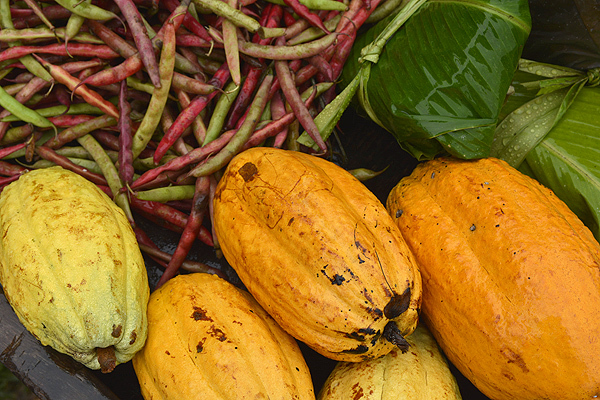 Short Maya women in pretty flowered dresses stand behind their tables of beans, cilantro, culantro, chile powder and cacao. Some sell clay necklaces, embroideries and baskets. Most the vendors are women, a few are men. The offerings are a stunning array of color on this slate-gray day: oranges, bananas, habaneros, plantains, cabbages, cantaloupes, gingers, tubers, tiny tomatoes, watermelon seeds and sapodillas. 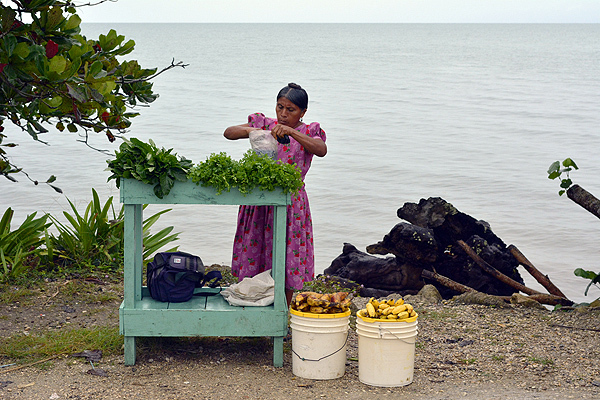 Some Maya women sell tamales from big plastic buckets. We buy two for breakfast. 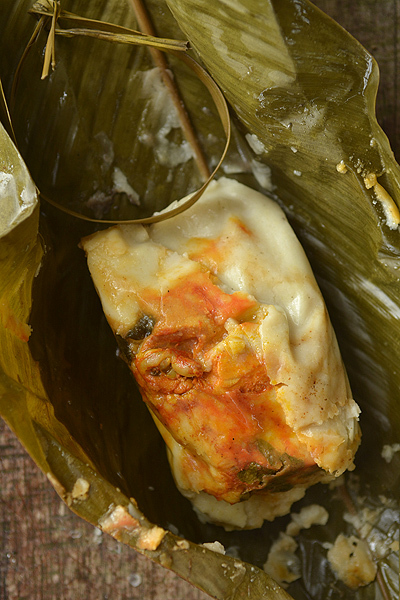 I’ve eaten a lot of tamales in my life, but never one quite like this. 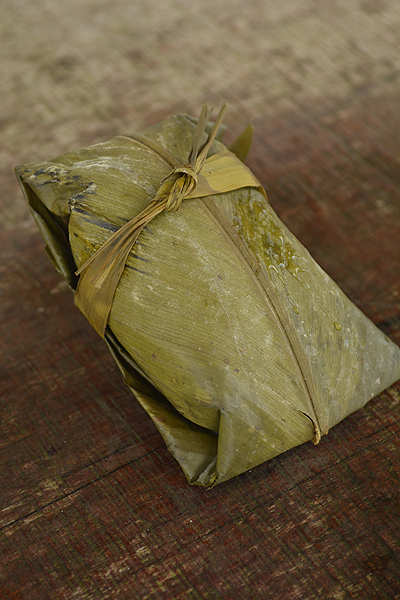 This tamale is enormous – whole chicken legs smothered in a thick white pouch of masa, double wrapped in heliconia leaves. The chicken and the surrounding masa are a beautiful amber-red color, from recado rojo, or achiote paste made with annatto and spices. It’s peppery on the lips but not tongue-scorching hot. Whole oregano leaves are baked right into the spongy corn. The leaves smell smoky and damp. It’s a salty, spicy, filling mound of breakfast, and I feel my girth expand as the tamale settles in my belly. Typically, the rains begin to cease this time of year, but our weeks in country are wet, wet, wet. It sprinkles, then pours on many market days. But when the sun does shine, the water sparkles and the streets move. The noisy storefronts up the road blare their speakers with music and sales announcements. Shoppers come to town from villages far away. Fish traders do a lively business in a dim concrete room against the pier where fishers unload their catch. The floor inside is slippery with seafood and feet. The air outside is thick and rich, perfumed equally by rainforest and sea. Your description made me feel the excitement of being there with senses all a flare with delight. I would live one of those tamales!